These are super fast to put together. 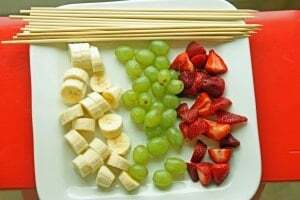 We used strawberries, grapes and bananas. But I also think kiwi or pear would be delicious. 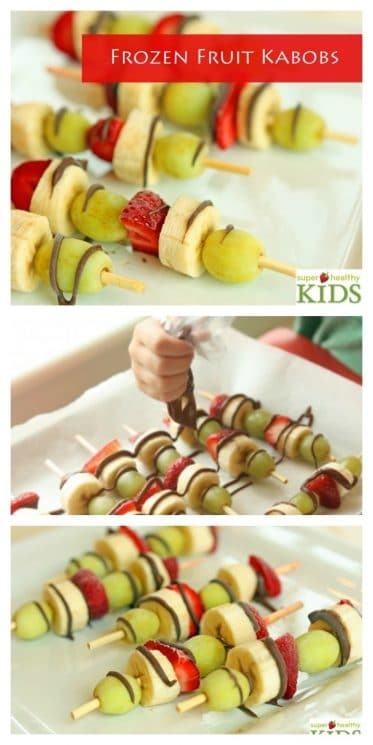 Your kids can help you skewer the fruit and then they can make their favorite combinations. Place on a tray lined with parchment paper. You could stop here and freeze them. But for an extra delicious treat……. Drizzle with chocolate! We used melted Nutella, but you can use any type of melted chocolate. 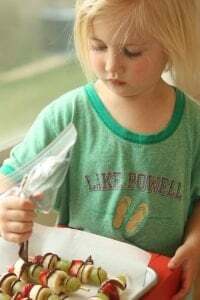 Just put in a baggy, cut the corner and let your kids drizzle it on. Amelia took her job very seriously. And then she licked the chocolate from the bag. Ha. Place in the freezer for a couple of hours and then you can eat them! To store, remove from the tray and place in a freezer-safe container. They should stay good for a month or so (if they last that long) When you are ready to eat them, they are a bit easier to eat if they have sat out for a couple of minutes just to soften a bit. Enjoy! These look great! 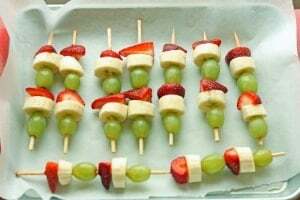 I think I am going to try them with strawberries, bananas, and mangoes! It’s great to see your kid getting involved in the creation of this delightful yet healthy snack. Kabobs are not usually frozen, hence I want to tap you for a great work! 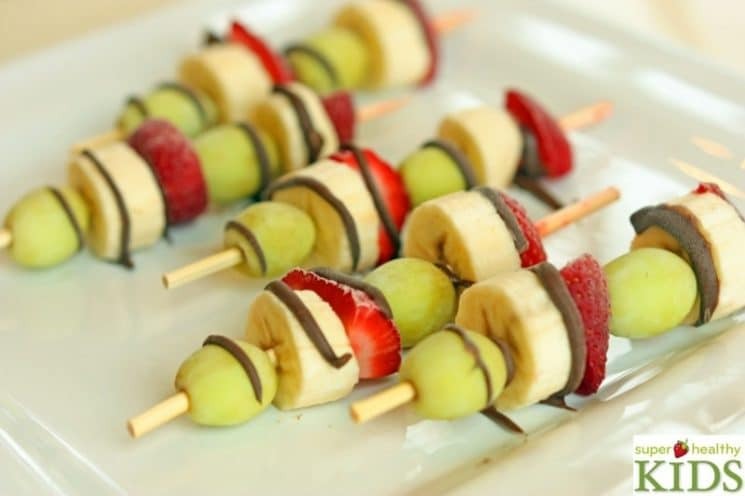 Plus, I like the way these little healthy ingredients look like candies on a stick. They look so good with that Nutella! 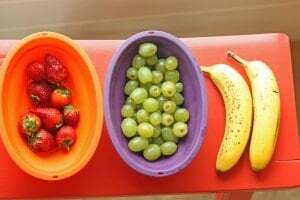 I am going for bananas, pineapples, and apples, do you think apples will be very tough? If yes, then can I substitute them for clemantines? This looks so appetizing not just for kids! 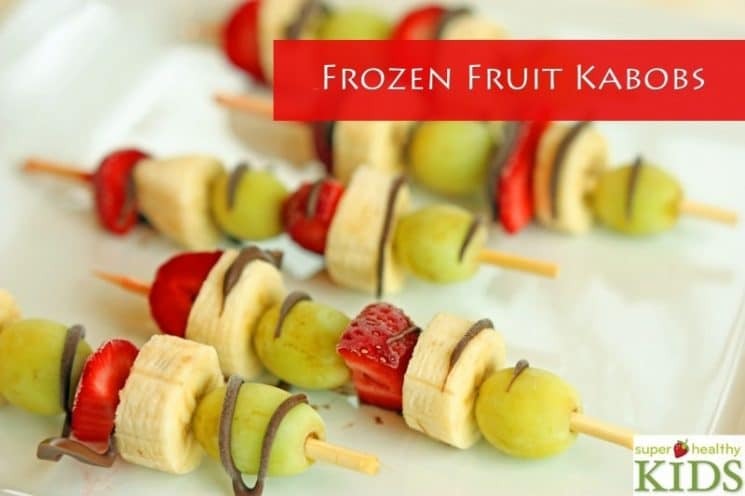 I will certainly try this with in season fruits. Just made them and tried them! It was so good, that my 6 year old brother was convinced it is fruit shaped sorbet! My son loves these. You can obviously have theme with loads of variations! 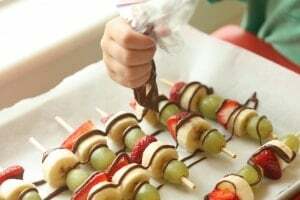 I work in a school kitchen in a primary school and think your ideas are brilliant i know that my kids would love to try some of these recipes is there any chance I can use some of your fantastic ideas.